In 1932, August Horch unveiled the Audi brand. Meaning “Listen” in Latin, Audi are one of three main German Giants of the motor industry alongside BMW and Mercedes-Benz. They currently have some of the most stunning and luxurious vehicles on our roads and have earned a reputation for quality and finesse. The Audi badge shows a ring for each of the founding companies that merged to form the Audi we know today, which has become a symbol for efficiency and motoring excellence all over the world. In 1994, Audi unveiled the A8 which featured their new “Space Frame” concept. These new aluminium bodies saved extra weight and improved torsion rigidity compared to a conventional steel frame. The film “Iron Man” (2008) featured Tony Stark driving the Audi R8 through dusty desert terrain, while the Audi TT featured in the film “I, Robot” (2004) in the shape of a concept called the TT RSQ. This Sci-Fi genre links seamlessly with what Audi stand for today and brings a whole new level to their slogan “Vorsprung Deurch Technik” (Advancement/Edge Through Technology). In our opinion Audi’s are still one of the very best looking cars on the road at the moment, but they don’t look so good on the hard shoulder – Make sure you protect yourself with an Audi car warranty from Warrantywise. We guarantee not to be beaten on price and cover for any Audi car warranty. Powerful, spacious and smart looking, the Audi A3 and S3 are at the high end of hatch backs. The crisp, classy interiors will leave you feeling as though your at the top of your game. One of the most popular Audi’s on the road today, we can’t see the A3 going anywhere soon. The Audi A4 and S4 are very much comfort cars. With big spacious interiors, folding seats and large amounts of boot space, this is the preferred mode of transport for many in the UK. Often used by government officials in China, you can rest assured your driving in style. The Audi A5 and S5 are powerful and up market while still retaining a decent MPG ratio. Interior space is not as abundant as in the A4 but the weight saving is apparent with how fast it can move off the mark. Smart yet sporty looks make them even more desirable. The Audi A6 is one of the best Executive Saloons out there. Utilizing raw power and no small amount of interior space, it combines potency with practicality. Relatively modest looks give the A6 a certain air of sophistication. The Audi A7 is one of the best motorway cars available due to its superb handling and ride quality at high speeds. Available with air suspension and four wheel drive, the A7 is all about the drive. The Audi A8 and S8 are the peak of its Executive range. If power is something your concerned with, you can get a 6.3 litre engine in this model! Likely to be chauffeur driven, the A8 really does look the part and its performance is excellent. The Audi Q3 is an attractive little SUV Crossover with a stylish interior and modern, muscular body. It gives a little extra space inside and a better view of the road than smaller hatch backs. Often the preferred choice for someone who doesn’t require the size and power of its bigger sister. The Audi Q5 another SUV crossover and the next level up from the Q3. Its a bigger model with slightly rounder looks. The spacious interior, folding seats and large boot space make the Q5 a practical all rounder and with the option to have a 3.0 litre supercharged V6 engine, you wont be lacking in power. One of the biggest SUV Crossovers around, the Audi Q7 is a huge car and can seat seven in absolute comfort. It comes with leather interior as standard and has an eight-speed tiptronic gearbox. Designed for road driving rather than off roading, the Q7 has a fantastic ride quality and for such a large vehicle, it handles pretty well too. The Iconic Audi R8 is an animal. It manages to look as intimidating and sophisticated as a Bond villain while being that little bit more insane. Top speed of just under 200mph and 0-60 in the three second territory, this is a luxury super car worth owning. The Audi RS4 looks very different to how it drives. It has a family car look about it but don’t let that fool you. The RS4 has a lot of power and can outperform the early Audi R8 from 0 – 60. Subtlety and modesty drip from the exhaust in this speedy estate and it will leave you with a smile. The Audi RS6 is the most powerful Audi available. The typical estate car looks are lost with the RS6 with its exterior styling. Large, warped wheel arches and an aggressive front end make this car stand out from her smaller sister. The interior is packed with chrome and leather finish to really give you the feeling your at the top of the range. 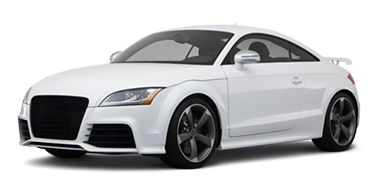 The Audi TT is famous for its interior, boasting one of the cleanest and best looking cabins on the market. With Audi’s Space Frame design, the TT is very light and agile with very good handling. Any TT owner will tell you how much fun it is to drive due to its responsive steering and low, sporty stature.